The Kansas City Star has been running a series on public policy called the “Missouri Influencer Series.” The series highlights responses to questions on various issues, including education, from 51 highly influential individuals in business and politics. You should check out the responses, especially the ones from Show-Me Institute folks (Patrick Ishmael, Patrick Tuohey, and Crosby Kemper III). Pulling from the influencers’ responses, the Star concluded that Missouri needs to pay teachers more. That’s all fine and dandy, but simply paying teachers more is not the solution. As the editorial board points out, schools need to do a better job of paying the best teachers more. The board writes: “Deciding which teachers are “best” is complicated, of course. Test scores? Graduation rates? Classroom grades? Peer reviews? Yet the broad concept of rewarding quality teachers is sound.” I couldn’t agree more, and here’s why. Most school districts pay teachers on a single salary schedule. This means if you are a rock-star physics teacher with dozens of other lucrative job prospects, you will be paid the same amount as a less-motivated and less-capable teacher who couldn’t find another job if he tried. This pay system is attractive to low-skilled workers, but pushes individuals with a lot of potential into other fields. This was effectively illustrated by economist Kirabo Jackson on Twitter. I have recreated his graph (which he posted on May 31) below. The solid red line represents the single salary schedule. The blue line represents the ability of a teacher to earn more outside of teaching. As you can see, individuals with low ability (those to the left of point A) are likely to find a teaching career attractive. Meanwhile, higher-ability individuals have an incentive (better pay) to pursue another job. Now look what happens when we simply raise teacher pay (red dotted line). We shift the number of those who would like teaching from point A to point B—a marginal improvement at best. Now consider what would happen if we had a pay system that actually paid teachers based on their ability. This is represented by the green line. 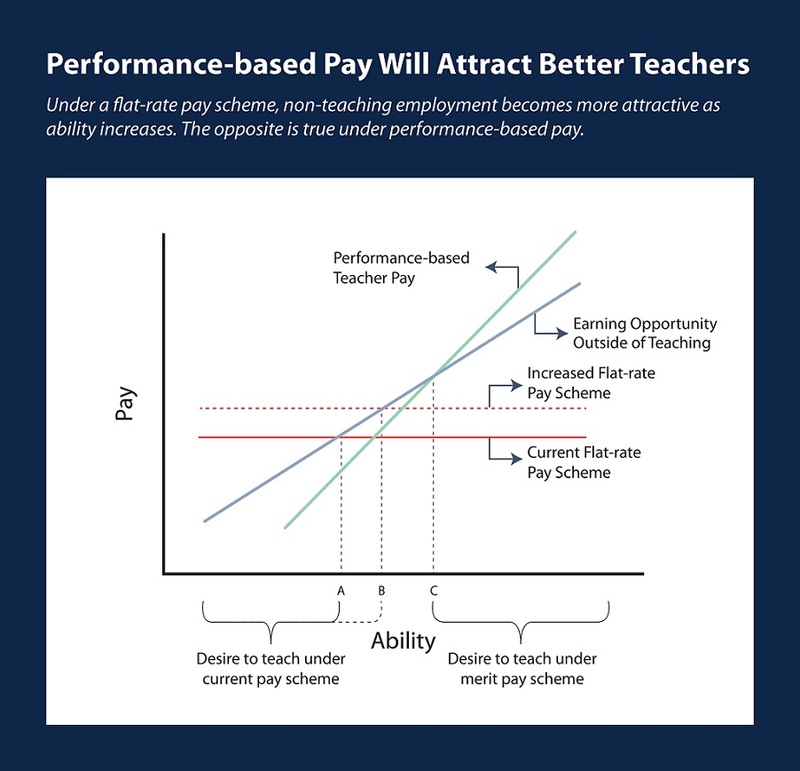 While the current system is designed to attract the lowest-skilled individuals into the profession, changing the pay structure to reward high performing individuals could make teaching desirable for the best and the brightest. The Kansas City Star’s editorial board is right: We should pay great teachers more. And we should do it by changing how we pay teachers.